Join us for our January meeting as we map out our agenda for the New Year in our continued quest to make Long Island more dog-friendly. Tops on our 2019 list: More access to Nassau County parks and increased access to Suffolk County beaches! Also on the agenda: LI-DOG’s many upcoming events. For more information check out New Year New Resolve: LI-DOG Jan. 2019 Meeting! Make Long Island More Dog-Friendly! Join us for our January meeting as we map out our agenda for the New Year in our continued quest to make Long Island more dog-friendly. As we endure the “bone” chilling temps outside, it’s actually time for us to get our plans in gear so that we and our dogs can enjoy the outdoors in Spring and beyond. It’s “snow” fun when our pooches are not welcome to join us at so many of Long Island’s parks and beaches. We’ve made tremendous progress in recent years, but there’s more to do! At LI-DOG, our mission is to continue to expand dog owner access to public parkland. In addition to helping to create dog parks, LI-DOG also strives for more ON-LEASH access to public trails and parks as well as off-leash access to Long Island’s many miles of public beaches. We’re always looking for volunteers to help make our initiatives happen. We need YOU, the dog loving (and VOTING public), to lend your voice and time. Find out more and get details on how to join us at the LI-DOG Jan. 2019 Meeting! Let us know if you can come! LI-DOG keeps the dog-friendly fun continuing year-round but it all wouldn’t be possible without the help and support of our dedicated volunteers. Have an idea for an event or thoughts on how to make an event extra special? Let us know and help to plan our next year of dog-friendly fun for people and pups! To learn more visit Let’s Get Ready for 2019 LI-DOG Events Meeting! LI-DOG keeps the dog-friendly fun continuing year-round but it all wouldn’t be possible without the help and support of our dedicated volunteers. Have an idea for an event or thoughts on how to make an event extra special? Let us know and help to plan our next year of dog-friendly fun for people and pups! Join us on Thursday, October 18th at 7pm at the Plainview-Old Bethpage Public Library for the LI-DOG “Let’s Get Ready for 2019!” Events Meeting where we will brainstorm, snack on light refreshments, and get our dog-friendly events rolling! Let us know how your skills and talents can help LI-DOG have the best dog-friendly events this year! Join us on Thursday, October 18th. If you can’t attend the meeting and you’re not currently on our volunteer list, just send a message to events@lidog.org and let us know you would like to help. We’ll be excited to hear from you! We hope to see you on the 18th! .02/22/2018 – LI-DOG 2018 Events Meeting! It may be cold outside, but at LI-DOG we are busy planning this year’s dog-friendly events for you and your pups! Be a part of the planning and part of the fun! Join us for the LI-DOG 2018 Events Meeting and find out how you can help get our great, dog-friendly events rolling! 02/22/2018 – LI-DOG 2018 Events Meeting! It may be cold outside, but at LI-DOG we are busy planning this year’s dog-friendly evens for you and your pups! Be a part of the planning and part of the fun. Join us on Thurs., February 22nd at 7pm at the Plainview-Old Bethpage Public Library for our LI-DOG 2018 Events Meeting and find out how you can help get our dog-friendly events rolling! Let us know how your skills and talents can help LI-DOG have the best dog-friendly events this year! Join us on Thurs., February 22nd. We hope to see you on the 22nd! Have you ever been involved in or witnessed a touchy situation at the dog park? An incident between dogs can often lead to disagreements between dog owners. Learn how to prevent and defuse touchy pet-related situations at the dog park when Debra Vey Voda-Hamilton, a Pet Care Planning Advocate and Conflict Mediator, joins LI-DOG for our November 16th Meeting! Debra will share her knowledge and expertise in applying skills related to social boundaries, problem resolution and legal policies in situations ranging from the dog park, to your neighborhood and even within your family! This FREE LI-DOG event is for any dog owner that values positive social experiences not only for their dogs, but for themselves! Hamilton is also the author of Prepare for your Pet’s Care; The Road Map for Short and Long Term Care For the Animals You Love. Join her and LI-DOG on Nov. 16th when she’ll share her knowledge of preventative measures and peaceful reconciliation when faced with conflicts over animals. Please note: As space is limited at the library, all RSVP’s must be done on the LI-DOG Meetup group. Please remember to keep your RSVP up to date, so we can accommodate everyone who can make it to our meeting on Nov. 16th! To learn more about Debra’s professional practice and her work, visit hamiltonlawandmediation.com or call (914) 273-1085. Please join us for our LI-DOG Nov. Meeting with Deborah Hamilton and her Play Nicely at the Dog Park presentation! Have you ever been involved in or witnessed a touchy situation at the dog park or in your neighborhood involving your dog or other people’s dogs? These situations can often lead to disagreements. 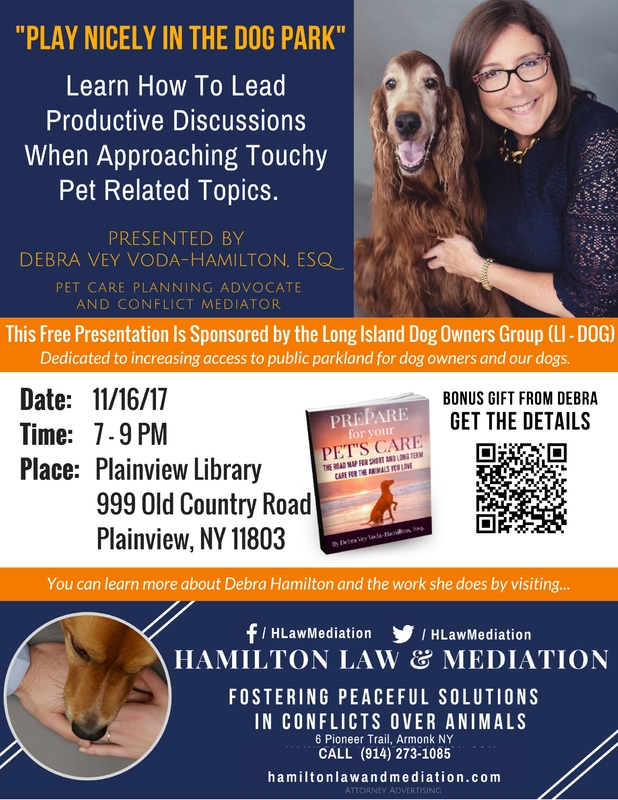 Learn how to prevent and defuse touchy pet-related situations when Debra Vey Voda-Hamilton, a Pet Care Planning Advocate and Conflict Mediator, joins LI-DOG for our November 16th meeting! For details, go to LI-DOG Nov. Meeting Deborah Hamilton Presentation Play Nicely in the Dog Park. Do YOU know how to help your pet in an emergency? Join LI-DOG for our April Meeting to find out how! Tom Rinelli, founder of Paws N Claws 911 Inc. in Lake Grove, NY, will present an informative lecture Helping Your Pet in an Emergency complete with a hands-on demonstration of how to manage choking in conscious & unconscious pets at the LI-DOG April Meeting at the Plainview Library on Thurs. April 20th. The information Tom shares will include pro-active safety in the home/workplace to reduce choking potential, signs and symptoms of choking, how to effectively handle this emergency and dispelling rumors about ineffective techniques that are often seen on social media. 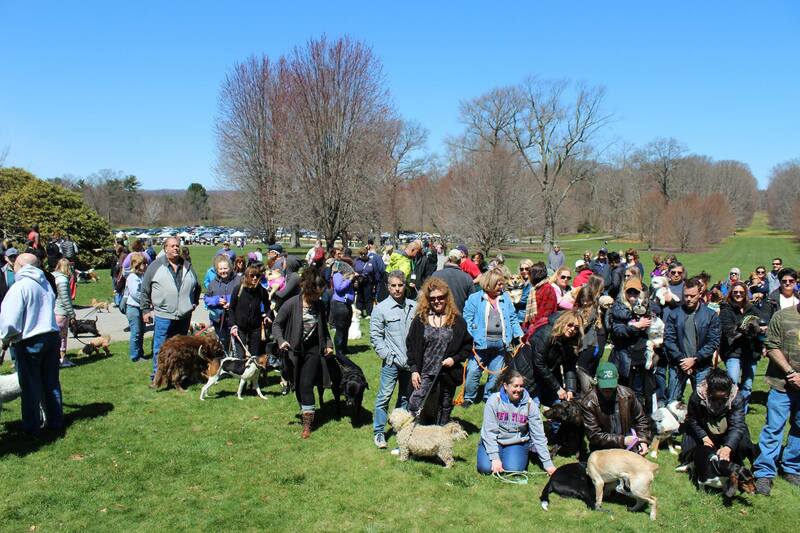 The LI-DOG April Meeting will run from 7 p.m. until 9 p.m. From 7 until 7:30 p.m., LI-DOG organizers will talk about developments in its campaigns for more on-leash and off-leash access to Long Island parks and beaches as well as the latest on upcoming LI-DOG events like the LI-DOG Pack Walk at Old Westbury Gardens on April 22nd and LI-DOG’s Pints-n-Paws Luau on June 11th. Tom’s presentation will begin promptly at 7:30 p.m.
We hope to see you for Tom’s presentation Helping Your Pet in an Emergency LI-DOG April Meeting! Please note: Only service animals are permitted in the Plainview-Old Bethpage Library. 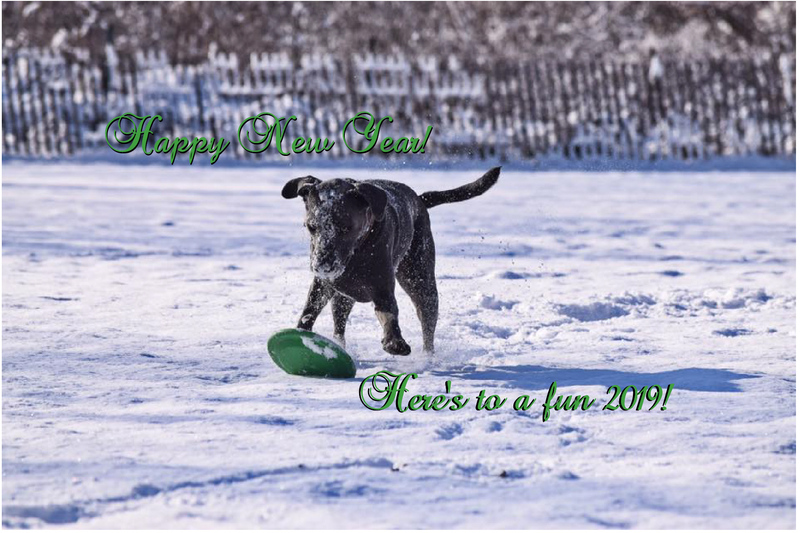 It may still be cold outside, but now’s the time of year when LI-DOG sets the calendar for all the fun dog-friendly events we hold throughout the year! To find out how you can help get our events rolling, join us on Thursday, Feb. 16 at 7pm at the Plainview Public Library. Check out the LI-DOG 2017 Events Meeting for all the details.